The North San­tiam, South San­tiam and Calapooia Water­sheds have sim­i­lar land­scapes, start­ing in steep forested uplands and mov­ing down to the Willamette Val­ley floor. Each has a mix­ture of land uses includ­ing forestry in the upper water­sheds, which tran­si­tions to more agri­cul­tural type uses in the lower water­sheds. Com­mu­ni­ties in each water­shed are small to mod­er­ate in size and there are a grow­ing num­ber of small acreage landown­ers. 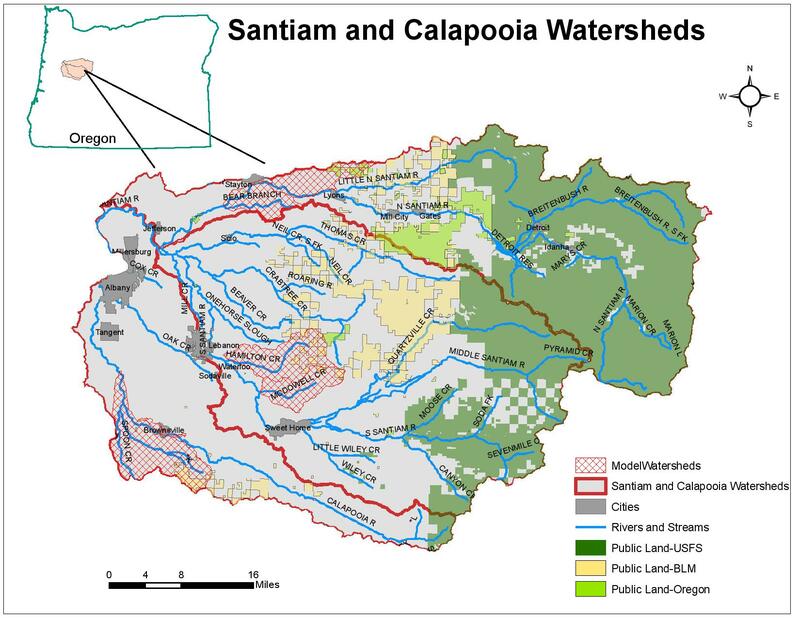 The San­tiam and Calapooia Water­sheds his­tor­i­cally sup­ported Upper Willamette Chi­nook Salmon Evo­lu­tion­ary Sig­nif­i­cant Unit (ESU) and Steel­head Dis­tinct Pop­u­la­tion Seg­ment (DPS). The North and South San­tiam rep­re­sent two of the four core spring Chi­nook pop­u­la­tions and all three water­sheds rep­re­sent three of the four his­toric win­ter Steel­head pop­u­la­tions. All three water­sheds are listed on the 303(d) list of water qual­ity impaired water bod­ies pri­mar­ily for exceed­ing sum­mer water tem­per­a­ture stan­dards. The Calapooia also has por­tions listed for E. Coli and the San­tiam is listed for dis­solved oxygen. The three water­sheds have sim­i­lar restora­tion pri­or­i­ties that were reaf­firmed by an online sur­vey of 34 multi-disciplinary par­tic­i­pants. Pri­mary restora­tion pri­or­i­ties include aquatic/in-channel habi­tat, floodplain/riparian habi­tat and fish species recov­ery. Sec­ondary restora­tion pri­or­i­ties include water qual­ity and quan­tity, wet­lands and upland habitat. The fol­low­ing sub-basins or reaches were selected to plan, imple­ment and mon­i­tor long-term restora­tion strate­gies to address the above priorities. The North San­tiam, South San­tiam and Calapooia water­shed Coun­cils have part­nered with Meyer Memo­r­ial Trust and Bon­neville Envi­ron­men­tal Foun­da­tion to model a col­lab­o­ra­tive approach between regional water­shed coun­cils in devel­op­ing and imple­ment­ing an adap­tive 10-year restora­tion and mon­i­tor­ing strat­egy. Please visit BEF’s Willamette Model Water­shed Pro­gram web­site for more infor­ma­tion. This col­lab­o­ra­tion shows eco­log­i­cal and eco­nomic effi­cien­cies in work­ing across tra­di­tional water­shed bound­aries and will be trans­fer­able to other Willamette Basin water­shed groups inter­ested in estab­lish­ing sim­i­lar effi­cien­cies through col­lab­o­ra­tion. 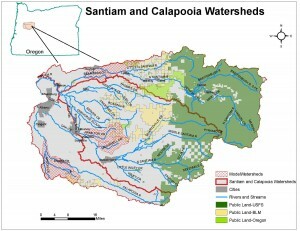 The Calapooia-Santiam Col­lab­o­ra­tion will focus on six sub-watersheds, each with a unique set of eco­log­i­cal, social and eco­nomic val­ues, yet offer­ing good points of com­par­i­son for study of water­shed response to spe­cific treat­ments. Restora­tion strate­gies will be devel­oped for Court­ney Creek and the mid­dle reach in the Calapooia Water­shed, McDow­ell and Hamil­ton Creeks in the South San­tiam Water­shed and Stout/Valentine Creeks and Bear Branch in the North San­tiam Water­shed. The lessons learned and tools devel­oped in these sub-watersheds will be uti­lized in other sub-watersheds in the region as these groups lever­age the Willamette Model Water­shed Pro­gram fund­ing out­ward to meet a broader restora­tion vision across the region.